I have added the library according to https://wiki.ugfx.io/index.php/Using_Eclipse. fatal error: gdisp_lld_config.h: No such file or directory gdisp.h /Display/ugfx/src/gdisp line 166 C/C++ Problem"
Does anyone have an idea to resolve this. Have you added a GDISP driver as per the instructions? 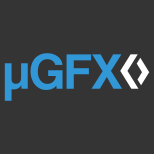 First i have imported the whole ugfx folder into the project under the "include" tab under "Path and Symbols". After that i added the ugfx folder to "Source location". with ctrl-a I selected everything. I deselected the src folder with gfx_mk.c and the drivers folder with the gdips and ILI9341. The error message is definitely showing that something went wrong with including the GDISP driver as @inmarket mentioned. Maybe @cpu20 can help as he's our IDE integration specialist. From your screenshots it seems that you included all the sources correctly. Not only the uGFX folder has to be included under "Paths and Sybmols", but also your gdisp driver folder. In your case you need to add the drivers/gdisp/ILI9341 folder to your "Paths and Symbols". This should fix the error. We fixed it. it was a problem in a atollic truestudio. We included both, but when we later looked under "C/C++ build" --> Settings --> Tool settings, we saw that the directory was only included under "Directories" under the de "C-Compiler" or the "C++-Compiler" (couldn't remember wich one, but under one of those two the directorie was not included under "Directories"). We copied the directory and pasted under the other one, and the error is gone. undefined reference to `gfxSystemTicks' . But i guess i have to provide then myself, cuz the library doesn't know my uC. So basically my program was that when i added the directory, the directory was not fully added and i had to add it manually. Hopes this might help other later that run into the same problem. Yes. i din't saw the link, but i got the same code as in the link. If you wrote the code for those functions but you're getting an undefined reference error you simply forgot to include the files in the compilation/linking process properly.